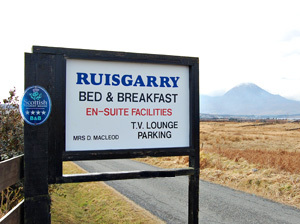 Ruisgarry B&B is located in the peaceful village of Breakish, near Broadford on the Isle of Skye. The house is 80 miles from Fort William and 85 miles from Inverness. 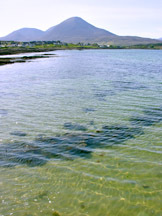 We are situated at the south end of the island, only 5 miles from the Skye bridge on the A87. To find the bed and breakfast after crossing the bridge turn right at the roundabout towards Broadford and Portree. Follow the A87 for approximately 3 and a half miles and take the first right turn after a small bridge towards Ashaig. Please note this turning is after turning to Kylerhea on the left. Follow this single track road for half a mile past the sign to Ashaig beach and after a bend to the left we are the sixth house along a long straight road. The house is marked by a large sign on the road. On arriving in Kylerhea on the Isle of Skye follow the dramatic single track road over the mountain pass for seven miles to meet the A87. Turn left towards Broadford and take the next right turning after a small bridge. Ruisgarry is the fifth house on the left hand side about half a mile along this road. On arriving in Armadale on the Isle of Skye follow the A851 for thirteen and a half miles until you reach the A87. Turn right at the junction and continue for half a mile down the A87. Take the first turning left at the top of the rise onto a small B road. Continue along the single track road and straight on past the junction with a turning to Lower Breakish. Ruisgarry Bed and Breakfast is the sixth house on the right. Please use the scale on the bottom right to zoom the map. 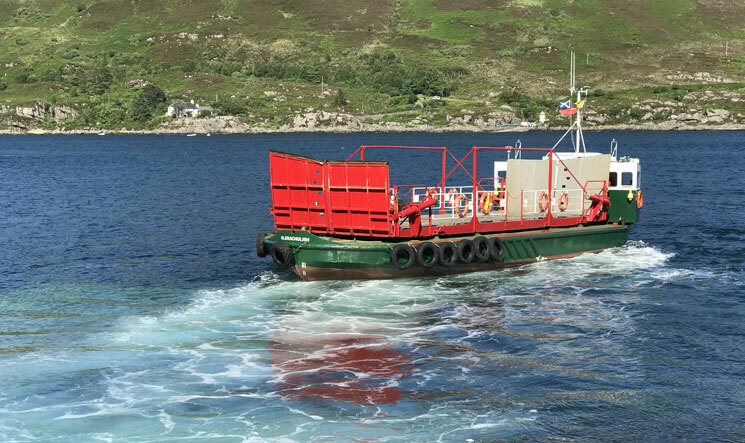 The Kylerhea Ferry is a unique way to arrive on Skye. 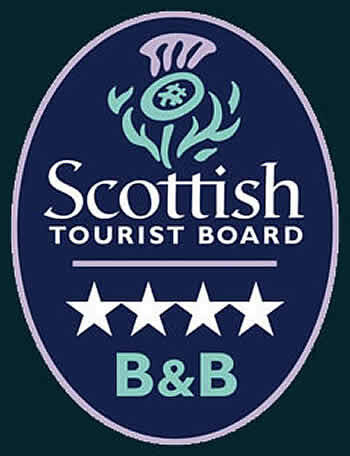 Copyright © 2019 Ruisgarry Bed and Breakfast Website by Skye Images.